Thanks to Audi, I can get my hair permed at One Piece Hair Studio Central Park with Eko. So here's the process! I came to salon with my hair unwashed (second day), but somehow my hair is greasier than usual. After a few minutes of consultation and hair check, my hair was washed and conditioned. Hair care used is all from Shiseido Professional. After washing and conditioning, I'm all ready for the perming! Before applying the perm formula, the stylist carefully applied vitamin to prevent further damage to my hair. Yes, all chemical process; coloring, rebonding, smoothing, perming, etc. is damaging your hair for sure. But with good salon, you can prevent further damage. After vitamin application, my hair is steamed using nano steamer. Final touch before perming; my hair is all rolled. With my hair all rolled, the stylist apply the perm formula all over it. It didn't smell that much and it's still manageable (I have sensitive nose though). Since my hair is only shoulder-length, the process is quite fast compared to others. Not to forget that I have naturally wavy hair. After applying the perm formula, they use this nano steamer again. After a few minutes, they will rinse my hair and repeat the process until it reaches the desired result. For me, my hair need perming twice. The perming process is faster compared to others since my hair is naturally wavy. After it's done, then my hair is washed and applied vitamin. The perming result will look better when the hair is a bit wet. The curl will be stronger when the hair is damp. Tadaaaa... Here's the result. I love it! So far this hair helps me to get ready faster. No need to blowdry my hair (usually it takes around 10-30 minutes including styling) since the curl is stronger when my hair is half damp. My hair also appears to have more volume, even on second day after hair wash. I actually experiences major hair loss. T_T But, yeah of course that's the consequences. But I am trying my best to tackle it by regularly put hair mask on my hair to prevent further damage. 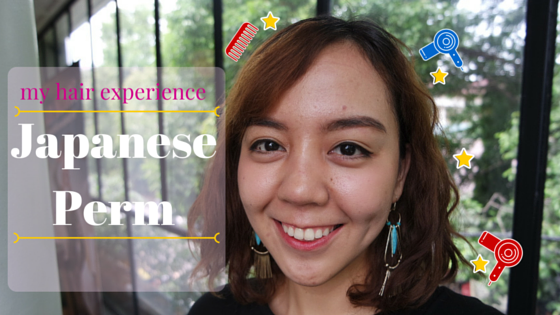 What do you think, do I look better with Japanese perm? Let me know in comments! Bagus rambut baru lebih bervolume. Lebih oke kalau pakai cream biar lebih ngembang dengan model "acak-acak"
Iyaa, sayang rontook.. Eh lo rontok kenapa la? the japanese perm suit you,looks fresh! Boleh tau salon dan budgetnya? Kalau masih takut keriting mungkin bisa coba C-Wave atau permanent blow. Hehe, aku ke salon One Piece Hair Studio di Central Park, budgetnya aku kurang tau karena ini jadi model hehe..